Can Apple's new Night Shift setting help you sleep? We carry our phones everywhere -- to meetings, the bathroom, the playground. And at the end of the day, we bring them into our beds where we make long, meaningful eye contact with their brilliant back-lit screens. Night Shift changes the colors of an iPhone or iPad screen to the warmer end of the spectrum, lessening the amount of blue light. The blue light has been shown to disrupt the natural production of melatonin, a hormone produced in the evening that tells our bodies it's time to go to sleep. The result looks like an overzealous Instagram filter, but the screen is still readable. Google (GOOG) is also testing a built-in night mode for its next version of Android. But researchers say these settings aren't exactly an easy fix. The new setting is in response to a number of recent studies that found that looking at back-lit displays can make it harder to fall asleep. 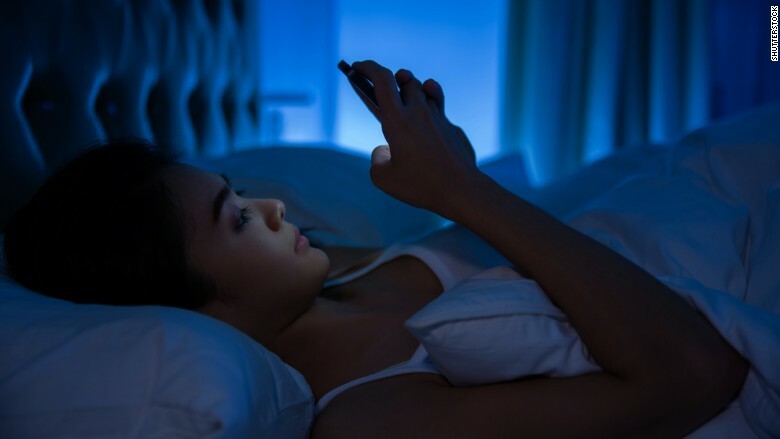 They've also shown that excessive screen time before bed can lead to sleep deprivation, which has been linked to things like obesity and heart disease. Researchers haven't yet studied the impact of these types of settings. Dr. Mariana Figueiro, a researcher at Rensselaer Polytechnic Institute who studies the impact of screens on sleep, says she has done some calculations on similar apps. "The idea is good, but it is not just about color. The intensity matters too, so color needs to be shifted and intensity needs to be dropped," said Figueiro. "But these options are better than nothing." You can manually adjust your screen's brightness, which also impacts melatonin production. Figuerio also recommends reversing the polarity, so that the screen shows white text on a black background, or holding the screen further away to reduce the amount of light reaching the eye.